The unofficial address of the Granada Native Garden is 801 Murrieta Blvd., Livermore, CA 94550 The map above and photos below can be enlarged for better viewing by clicking on them. If you are a Livermore Resident . . . • The Garden is directly across Murrieta Blvd. from the Nob Hill-RiteAid shopping center. Parking is available in front of RiteAid. The Garden is also directly accessible via the Arroyo Mocho Bike Trail. • See the map above for the safest place to cross Murrieta Blvd. and walk to the Garden, approximately 600 feet east of the Garden (toward Holmes Ave.). Note: Because of the boulevard center divider, there is no direct automobile access to the Garden for cars traveling from east to west on Murrieta Blvd. And no on-site parking at the Garden itself … see below for parking information. If traveling 580 eastbound to Livermore . . . • Pass Airway Blvd. and exit at Isabel/Portola Ave. • Turn right onto Isabel. • Continue past the big blue water treatment building; get in the left lane. • Turn left onto Jack London Blvd. Follow it to its end at Murrieta Blvd. • Turn right onto Murrieta Blvd. There will be 2 sets of traffic lights before you go under the railroad tracks at Stanley Ave. • Cross Stanley and get in the right lane, go 0.2 mile. • The Granada Native Garden will be on the right, just before an apartment complex at 975 Murrieta Blvd. The Garden is immediately to the right of the apartments. • Limited unauthorized parking is in the apartment complex, along the tall chain-link fence. Other parking is across the street in the Nob Hill/Rite Aid shopping center, but to get there you will need to make a left turn into the shopping center. See the map above for the location of authorized pedestrian crossing, approximately 600 feet east of the Garden. If traveling 580 westbound to Livermore . . . • Exit 580 at N. Livermore Avenue. Turn left onto Livermore Avenue. • Continue to Portola Avenue. Turn right onto Portola Ave. • Continue to Murrieta Blvd. Turn left onto Murrieta Blvd. There will be 2 sets of traffic lights before you go under the railroad tracks just before Stanley Ave. • Cross Stanley and get in the right lane, go 0.2 mile. • The Granada Native Garden will be on the right, just before an apartment complex at 975 Murrieta Blvd. The Garden is immediately to the right of the apartments. • Limited unauthorized parking is in the apartment complex, along the tall chain-link fence. Other parking is across the street in the Nob Hill/Rite Aid shopping center, but to get there you will need to make a left turn into the shopping center. See the map above for the location of authorized pedestrian crossing, approximately 600 feet east of the Garden. If traveling on Stanley Avenue from Pleasanton . . . • Follow Stanley Ave. into Livermore to the ARCO station at Murrieta Blvd. • Turn right onto Murrieta, stay in the right lane and go 0.2 mile. 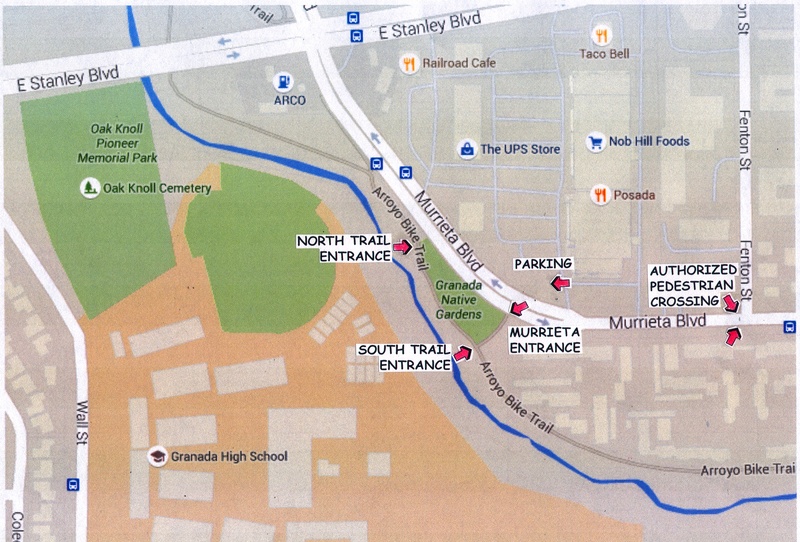 • The Granada Native Garden will be on the right, just before an apartment complex at 975 Murrieta Blvd. The Garden is immediately to the right of the apartments. • Limited unauthorized parking is in the apartment complex, along the tall chain-link fence. Other parking is across the street in the Nob Hill/Rite Aid shopping center, but to get there you will need to make a left turn into the shopping center. See the map above for the location of authorized pedestrian crossing, approximately 600 feet east of the Garden. If traveling from San Jose/Santa Clara . . .
• Take 680 north toward Pleasanton. • Take Exit 25 (Sunol Blvd.). • Continue on Sunol Blvd. thru Pleasanton; Sunol Blvd. becomes Stanley Ave. in Pleasanton; continue on Stanley Ave. toward Livermore. • Follow Stanley Ave. into Livermore to the ARCO station at Murrieta Blvd. • Turn right onto Murrieta, stay in the right lane and go 0.2 mile. 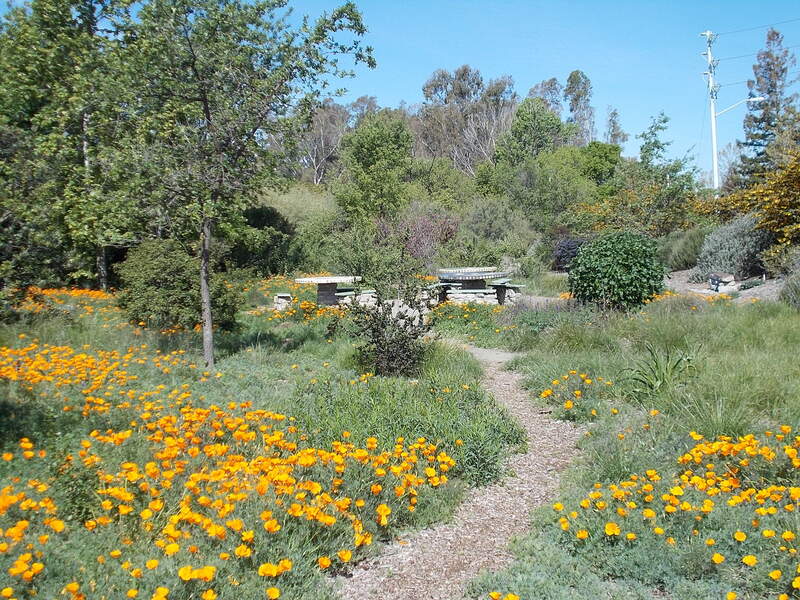 • The Granada Native Garden will be on the right, just before an apartment complex at 975 Murrieta Blvd. The Garden is immediately to the right of the apartments. • Limited unauthorized parking is in the apartment complex, along the tall chain-link fence. Other parking is across the street in the Nob Hill/Rite Aid shopping center, but to get there you will need to make a left turn into the shopping center. See the map above for the location of authorized pedestrian crossing, approximately 600 feet east of the Garden. NOTE: Because of the boulevard center divider, there is no direct automobile access to the Garden for cars traveling from east to west on Murrieta Blvd. Check out the Granada Native Garden Newsletter by googling “Granada Native Garden Newsletter”. 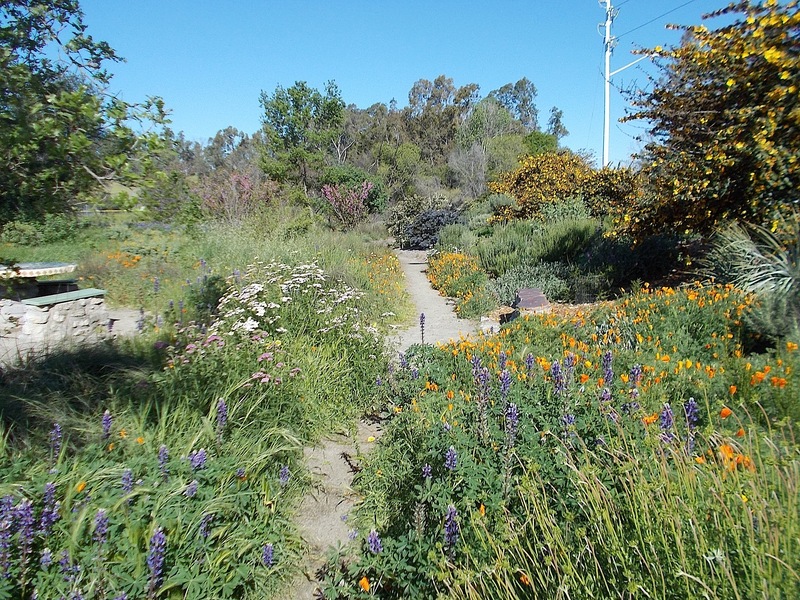 New articles about California native plants appear monthly, bimonthly, or irregularly. You can be informed by email whenever a new article appears by clicking the FOLLOW button at the lower right corner of your screen. You can also contact the Garden personnel by emailing the staff at JIMatGNG@gmail.com .